Democratic candidates haven’t always had labor’s back—but Republicans are intent on ending collective bargaining altogether. On Tuesday, Michigan voters will pass final judgment on whether public workers should fork over their bargaining rights to politically appointed “emergency managers.” California will consider forcing unions to hand-collect any dues money used for politics. And Georgia and Washington will vote on paving the way for waves of new non-union charter schools. 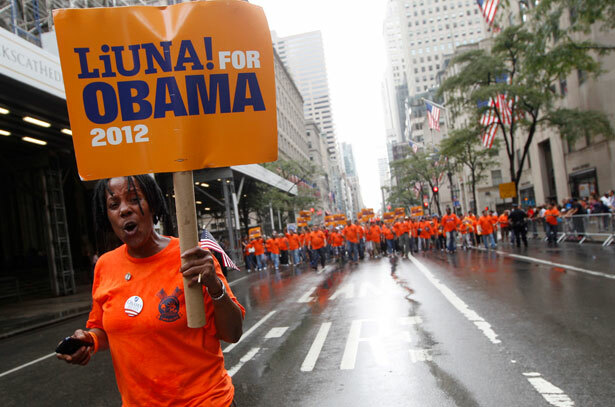 In 2008, unions invested unprecedented time and money to elect Obama president. Four years later, the results are mixed. The president passed labor-backed healthcare and banking reforms, but barely offered lip service to the anti-union-busting Employee Free Choice Act. He appointed National Mediation Board members who made it easier for airline and railroad workers to organize, then signed a law that made it harder. His stimulus funds kept teachers on the job, but his Race to the Top rewarded states that made it easier to fire them. He stepped up trade cases against China, but pushed a massive NAFTA-style trade pact. After initially acceding to obstructionism, Obama defied GOP stalling tactics and recess-appointed a pro-labor majority to the National Labor Relations Board. But after proposing a regulation restricting child workers from using dangerous equipment on factory farms, his Labor Department scuttled it. While Obama and his fellow Democrats have sent mixed messages on labor rights, you can’t say the same about the GOP. In the states, Republicans have laid off slews of public workers, frontally assaulted collective bargaining and even tried to ban picketers from disrupting “quiet enjoyment.” In Congress, they’ve pushed laws to make it harder for workers to organize, and easier for companies to get away with busting unions by moving factories. Asked whether disappointments under Obama have had any impact on the resources the AFL-CIO devotes to re-electing him, AFL-CIO President Richard Trumka told The Nation, “Absolutely not. When you come to look at the two visions between Romney and President Obama, President Obama has been there to help us.” Trumka cited Obama’s appointments to the NLRB and the Mine Safety and Health Administration. “And while our agenda, the working people’s agenda, is not completely fulfilled,” he added, “we’ll be working on it in the second term. He’s been a friend. We’ve exerted everything that we have” to re-elect him. Labor’s mobilization around the election comes in many forms. The AFL-CIO, which is the largest US labor federation, runs what it calls the country’s largest independent political program. This year, it pledged a reboot of its approach to politics: investing more cash in its in its own political infrastructure rather than the Democrats’, prioritizing face-to-face contact rather than TV ads, and exercising unions’ post–Citizens United freedom to communicate with non-union workers as well as their own members. In the final four days of the campaign, the AFL-CIO has pledged that 128,000 volunteers will knock on 5.5 million doors, make 5.2 million phone calls and distribute 2 million worksite leaflets. And as I reported for The Nation last month, the AFL-CIO affiliate Working America is out to persuade and mobilize white working class non-union voters in states like Pennsylvania and Ohio. That doesn’t count the efforts of individual unions (within and outside the AFL-CIO), many of which run their own campaign ads or GOTV programs. The Amalgamated Transit Union says its members will hand Get Out the Vote leaflets to a million transit riders, urging them to vote. The Service Employees International Union (SEIU) plans to reach 3 million doors knocked and nearly 3 million phone calls by Election Day. The NEA says that 481,000 of its 3 million members have volunteered at least once this election cycle. Van Roekel says NEA members “have great faith in President Obama” because “he supports labor, middle class, education, and has a great vision for the future.” He cites the stimulus, the Affordable Care Act and the Lilly Ledbetter Fair Pay Act. The two parties’ platforms illustrate labor’s bind. In August, the Republicans released one that adds a raft of new anti-union planks, from backing a federal “right to work” law that would discourage unionization, to making it easier for non-union contractors to outbid higher-wage competitors, to touting anti-union “reforms” like Walker’s and Kasich’s. A week later, the Democrats released a platform that, while pro-union, drops some past commitments, like strengthening the right to strike. Four years after unions went all out for Obama, the urgency may be similar, but the expectations are diminished: re-electing the president not for a bounty, but as a bulwark.